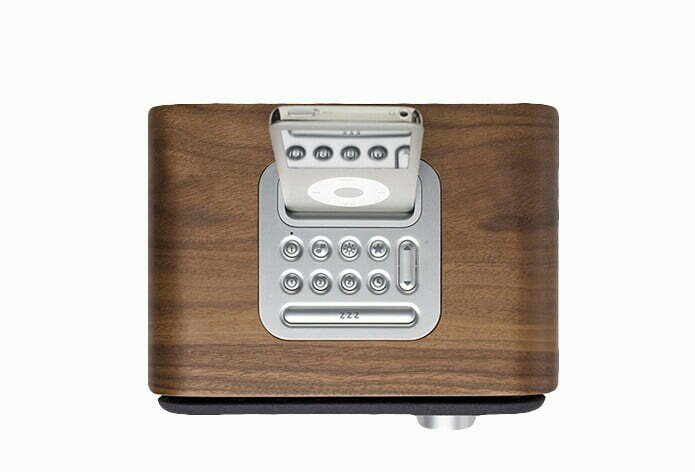 Yet another in a long line of products being refinished and redesigned with wood in mind, Vers Audio has created a compact iPod and iPhone dock meant for use on your nightstand, in your kitchen, or anywhere you need a charging station and some tunes. The Vers 1.5R dock ($200-$220) features a vintage-inspired look with a handcrafted wood body housing a 15-watt speaker, a simple LCD display on the front, and a single large volume knob. The wood is available in several different finishes, including walnut, dark walnut (above), cherry, and bamboo. Meant as a compact, multi-function dock, the 1.5R charges and plays music from your iPod or iPhone and has an AM/FM sound system, dual alarms, a sleep timer, and favorites settings for perfect bedside customization. 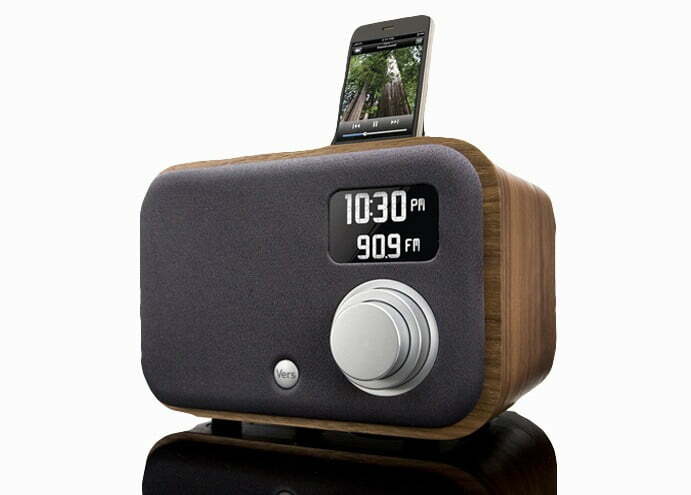 The dock’s simple design makes it easy to use, and it doesn’t have enough functions to overwhelm or be unnecessary, though we’re not sure anyone really listens to the radio these days. Regardless, having the AM/FM functionality is a plus, as is the 18-function remote that comes with the dock and has all of your basic adjustments as well as buttons for favorites, shuffle, changing playlists, and bass and treble controls. Even with its front speaker and rear port bass design, the audio power on this little guy matches its size. Instead of full, clear, perfect sound, we only got decent audio quality (with a bit of a hollow sound) that did improve when we bumped up both the bass and treble controls. While we weren’t wowed by the sound, the quality is enough for any non-audio-snob to appreciate and enjoy in a small space like a bedroom, kitchen, or office. With its compact size and price, that’s what the dock should be used for anyway. The dock plays and charges all docking iPods and houses batteries for back-up power to preserve your customized settings. We can also appreciate the remote, which is larger than most dock remotes. It seems counterintuitive, but smaller isn’t always better, especially when you are trying to keep track of things. We wouldn’t recommend this dock as a home audio system, or for anyone who is concerned with fine-tuned audio quality, but the Vers 1.5R would be a great option for someone who is looking for a basic iPod dock and alarm that takes a step up in design from the competition. It is beautiful, after all.